Have you ever read the ingredient list of your store-bought tomato sauce? You'd be surprised to find that it's most likely loaded with added sugar, preservatives, and excess sodium. I got in the habit of reading labels years ago. It's amazing to find what is in products that are even labeled "all-natural," "organic," "sugar-free," etc. Point is, why spend money on these products that are not good for our health when they're so easy and more flavorful to make at home? Preparing your own sauces, dressings, and dips is fun and provides lots of health benefits. 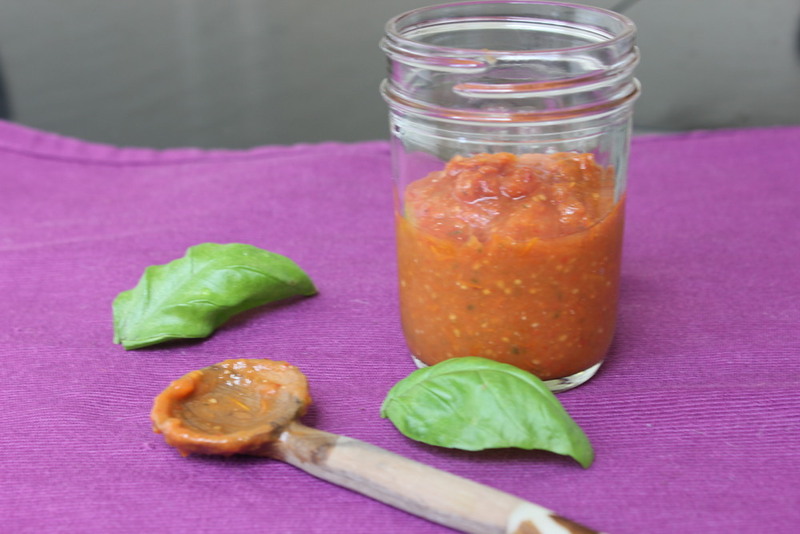 There are many types of tomato sauces out there. This is my go-to base recipe. It's so simple, yet full of flavor. You can add different herbs and spices to make it your desired flavor (i.e. roasted garlic, chiles, etc.). Use sauce on vegetables, grains, chicken, or fish. Place tomatoes on a glass baking dish or parchment-lined baking sheet and roast in oven for 15-20 minutes, until tender and skin has cracked. Let tomatoes cool for a bit and once manageable, take skin off and discard. Place tomatoes and remaining ingredients in blender and blend until smooth. Taste and adjust if needed.